Ideal for both commercial and domestic applications. Compatible with all automatic liquid chlorinator systems. Add to the bulk drum when refilling. Never add to the pool. Do not use with any other type of chlorinating or brominating device. Continual use of anti-crystallite in un-balanced pools may result in staining of plastic pool fittings. Make sure that the water is always in balance. Read directions on bottle for dosage rates and instructions. 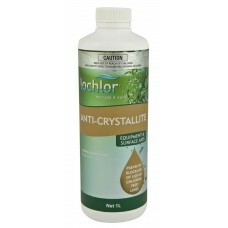 Lo-Chlor Anti Crystallite contains a blend of potassium permanganate and other rare compounds. These metallic compounds can cause mild staining. 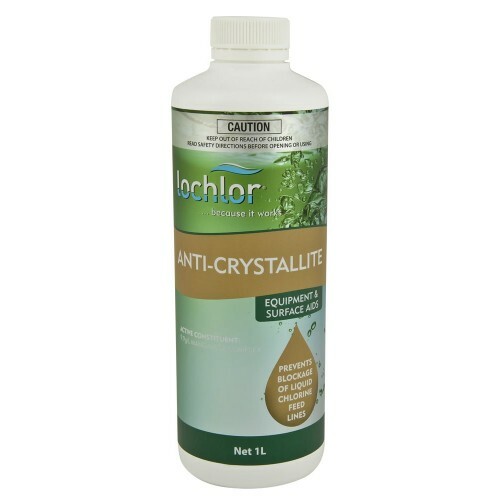 • If staining occurs, an addition of Lo-Chlor Multi Stain Remover followed up by Lo-Chlor Metal Solution will remove such stains within minutes.